Today in 2013: After leading this great church Small Group for four and a half years, I stepped aside as the leader. 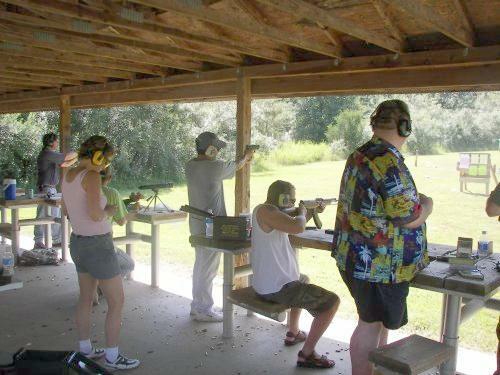 We taught countless people from age 6 - 76 how to handle firearms and shoot safely. Other life responsibilities took precedence in 2012, but this Group will be one of the great remembrances and experiences of my lifetime. The Group was part of the Small Group Ministry of Harvest Time Church in Western Arkansas. I served as both the Group Leader and part time as Range Safety Officer from February 2007 till mid 2012. There were no accidents, injuries or legal issues. The Group was a picture of integrity for the church it proceeded from. Below is the article I wrote when the Group was still operating. It’s hard to believe that the bunch below is a Christian church group. Don’t let their looks fool you. 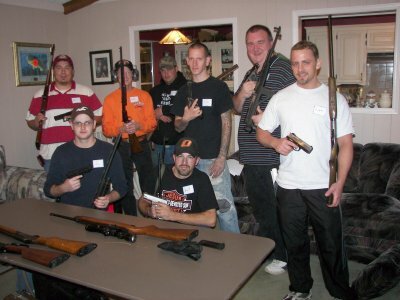 I just had them pose for the picture during an informal “gun show” at my house. Most of the guys pictured are dedicated Christians who spend their lives serving God and people. The group pictured was the beginning meeting of the Harvest Time Church Small Group: Right On Target. Since that meeting, we've had a lot of shooting time together. Before going into the particulars of the activities of this church group, I want to be sure to point out the value of Small Groups in a Christian church. Our church has a real congregation of around 3500 people. Small Groups are the primary connection point for many people who are anchored in the church by developing close relationships within the groups that they attend. Harvest Time has Community Small Groups which are general in their scope of activity, S.I.G.H.T. Groups (Shared Interest Groups at Harvest Time), and Leadership Groups which operate within the individual ministries to care for, develop and recruit people for those ministries. Right on Target is a S.I.G.H.T. Group which is a great type of group, for not only connection, but for outreach to people who will not attend church. Many times, people who have rejected Christianity and consequently church, have been convinced by their association with Christians in a Small Group that Christians are the real deal and church is a vital and enjoyable part of the Christian life. This Christian church group is operating because of the openness to innovation and trust of the Pastor and Elders of Harvest Time. The reward for that openness and progressive thinking is the continual forward movement of the church in attracting new people. These type Small Groups get out where people live and play and provide an inclusive environment. In a shooting group or club risk is real. To operate this group or one where some degree of risk is present, a church must take precautions to avoid litigation in case of an accident. Our precautions start at the group level. It requires each group member that shoots to receive and read a set of written range safety rules. These are to be adhered to absolutely during the group activity meetings. Right on Target shooters get a “new shooter’s packet” that consists of a set of NRA Safety Rules, the Right On Target Range Rules, and Harvest Time medical waivers. Those waivers are signed by each person before participating in the group shoots. Added to that is a Range Safety Officer who watches to see that the Right on Target range rules are adhered to absolutely. 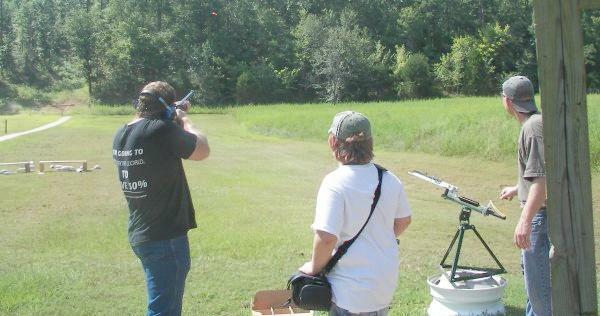 The result of those safety steps is shooting with people of all ages and skill levels without injury. I provide a comprehensive guide to starting and successfully operating a group like this. As to the operation of the group meetings, I pretty much carry a complete, portable range setup in my van. This includes bowling pins, target backing, colored paper targets, potatoes, clay pigeons, balloons,and a portable trap machine. At each meeting it takes about 30 minutes for a dozen people to unload and set up whatever range we meet on. But the beauty of this portable way of doing things is that it doesn't matter where we are. We have a colorful, challenging range for all types of shooting. Melons, cans of shaving cream, plastic bottles full of ice, potatoes are all good, satisfying exploding targets that are great for letting off a little steam. What kind of guns can people bring to the group? That’s a question we get often. The answer is anything legal, from air guns to elephant guns. We can set up for any type of shooting except for the super long range type of low caliber, high power rifles favored by some people. We always have challenging pistol, rifle and shotgun targets available from 25 feet out to about 125 yards. The key to a successful Christian church group like this is to make it inclusive for as many ages as possible and keep safety primary. Be always be willing and encouraging to reach out to those who have not yet embraced Christ, but are excited about joining in on the activity. The reality about Christianity is that it is not truly lived out in Church. It is lived out where we live, work and play. These small church groups give us opportunities in the best of both worlds. For more detailed information on developing a small group like Right on Target, or developing a Small Group ministry for your church contact me here.